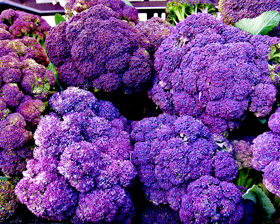 Unique breeding especially for summer cropping as needs no vernalisation (winter chill) to produce tasty purple spears. Robust plants will produce high yields if picked regularly to promote fresh flushes of spears. Calabrese Graffiti has good heat tolerance. Crops from July to October if sown at regular intervals. Sow seeds at intervals from March to June. Sow thinly in a well-prepared seedbed, 12mm deep. Keep watered during dry weather.